As part of a global project of modernization of a maintenance, leakage and gas refill plant, which also covers the STREGA and SINDACO systems, an “aesthetic control” is also encompassed. SEVERO is an intelligent system for the scrape, paint and rust segmentation on LPG cylinders, such as to decide if they require repainting or not, not only in automatic, but also avoiding the typical subjectivity of the human evaluation. The cylindrical surface to be segmented makes inevitable, in non-opaque cylinders, the presence of areas in which the light is reflected and makes difficult the segmentation process. Since these areas can only be removed with the use of a linear camera (that frames a single generatrix of the cylindrical surface to be rotated by a lathe: an approach, that however would increase the latency on the line, and the mechanical apparatus cost), it was decided to solve algorithmically this problem, raising the “intelligence” level of SEVERO: the algorithms developed by APIS have resulted effective in successfully segmenting both areas in which the reflection is particularly pronounced, both areas in shadow. The areas highlighted as oxidized or scraped, are then measured in terms of pixels, allowing the system to decide, on the basis of objective and configurable thresholds, whether or not re-paint the LPG cylinder. The thresholds can be changed by the supervisor of the maintenance center, for example, basing on the volume of cylinders operated at the time by the establishment. Another configurable parameter is the “size of the sieve” which sets the sensitivity as a function of the scan resolution: the scraped or oxidized areas will be considered only if larger than the set caliber. presence of a galvanized cylinder (which does not require painting). 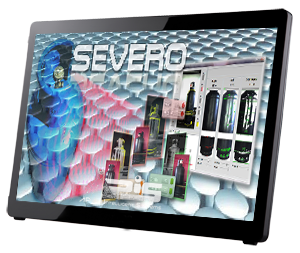 SEVERO is a significant improvement in the maintenance line, also representing a saving for the company, as it replaces (outperforming) the analysis conducted by an operator in a subjective manner.